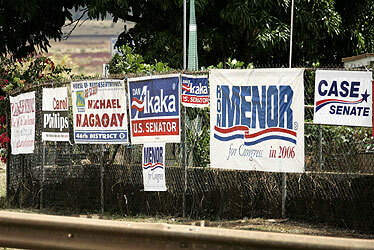 During the 2006 election, campaign signs were clustered on private property across from Waipahu High School on Farrington Highway. After two years of hearings, individual meetings, one-on-one education efforts and strong public demand for change, the state Legislature proved that it still isn't willing to clean up the eyesore created by campaign signs. A campaign sign reform bill, strongly supported by The Outdoor Circle, would have placed reasonable restrictions on the size and number of signs posted on residential property and would have greatly reduced the blight these signs often create in our neighborhoods. Specifically, the legislation would have limited the size of individual signs to a maximum of 2 by 4 feet. It also would have limited the total signage allowed on any residential property to 16 square feet. In essence, this would eliminate large campaign banners that have grown to billboard-size proportions and would have prevented properties at high-traffic locations from becoming wallpapered with dozens of campaign signs. Both of these limitations have been upheld by courts on the mainland as not infringing on individual constitutional rights. From the beginning of the session many, perhaps most, legislators viewed the bill as a threat to the status quo. However, with support from several key members, the legislation continued to advance and after it unanimously passed the House/Senate conference committee and was sent to a final vote on both floors, we were hopeful. Perhaps the message had gotten across after all. However, on the day the floor votes were scheduled, despite publicly expressing only minor objections for two years, House members voted to send the bill back to committee, thus killing it. In the Senate, it was a different twist. The bill passed on a vote of 18-7, but this was apparently not the outcome desired by the majority. A recess was called and upon reconvening, the just-approved campaign bill was recalled and the Senate voted to send it back to committee! Afterward, Senate leaders explained that they killed the bill for the good of their communities. Otherwise, they argued, the legislation would disallow signs for Huli-Huli chicken sales, community fundraisers and other events. Of course, that claim isn't at all true and shows a lack of understanding of the bill and how our sign laws work. The Outdoor Circle has led the fight to protect Hawaii's beauty from inappropriate signs and billboards for almost 100 years. Based on our own research and the large number of complaints our office and branches receive each election season, we believe our communities want the Legislature to reduce the blight created by campaign signs. Apparently, legislators are worried that altering the size of a campaign sign might jeopardize their chances for re-election. We intend to work even harder to change their minds. Betsy Connors is president of the board of directors of The Outdoor Circle, a statewide grassroots organization founded in 1912 to preserve and protect the beauty of Hawaii.